We here at SolidBox value productivity above all in our applications and of course, our hardware. 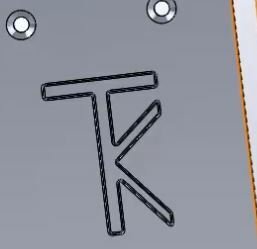 Each week, we’ll be giving you a tip to help you enhance your productivity with SolidWorks specifically. Sorry, we can’t help you with the hours you spend on Youtube each week watching cat videos, but hopefully you can learn something to make your SolidWorks experience easier. This week we’ll discuss Derived Sketches in SolidWorks 2013. Frequently in my designs, I find myself having to recreate an identical sketch entity on more than one face or surface on a part or assembly. Whether it’s a cut-out logo, or a port that shows up on multiple sides of your design, it can get quite tedious sketching out identical geometry multiple times. Luckily, there’s an easier way to accomplish this in SolidWorks 2013: Derived Sketches. By Deriving a Sketch, you essentially copy and paste any 2D sketch onto a face or plane. Any changes made to the original sketch filter down to any Derived Sketches as well, making updates to the Derived Sketch incredibly easy.